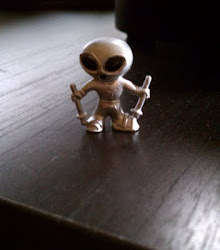 I am really enjoying the whole UFO Field Investigation process. UFO witnesses are just such nice people. The serious investigators are always talking about whether witnesses are credible or not -- Does he have a college degree? Is she an airline pilot? -- but I ask you, what does their "credibility" matter if they're not nice people? I'll take likeability over credibility any time. It's a shame I have to wait a week to start the investigation, because my caseload is piling up. Now that I'm State Section Director, and am directly responsible for investigations in Jefferson, Walworth, Waukesha and Milwaukee Counties, I have 31 cases weighing on me. 31! These four counties have a combined population of nearly 1.5 million, and that's not even including me. Let's say that 2 out of every 3 people, on average, see a UFO and report it to MUFON. That's a million cases to investigate! And that's all on me, folks, it's all on me. Okay, I know, my case load may never get anywhere a million. Thirty-one may be as bad as it gets. And it's not like I have to investigate them all myself. 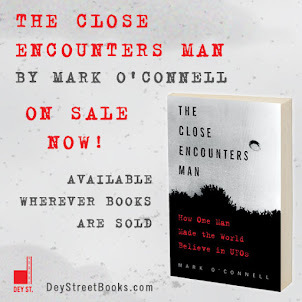 Apparently I have a crew of investigators working for me, but since I've never been told who they are I'll just have to hope that we bump into each other on the rim of the crater that's left behind the next time a UFO lands in the four-county area. just happened to look just above the tree line and saw a very bright glowing solid ball of light falling straight down until it went past the tree line and could no longer see it. 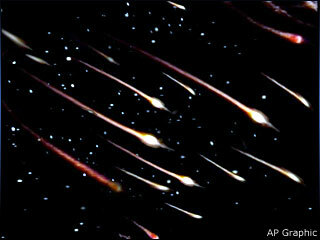 Meteor shower or alien invasion? I can't tell, either! Why do I say that? It's the first thing I thought of when I read "3 UFOs zigzagging during meteor shower." You see, aliens have been using meteor showers for cover since way back when. You wait for a meteor shower over the earth, and you slip in a few ships between all the meteors and no one's the wiser. But it only works if the ships travel in a straight line. You know, just like the meteors do. To slip into the earth's atmosphere during a meteor shower and then go zig-zagging all over the place reveals a certain misunderstanding of strategic thinking among the aliens that I find quite reassuring. I am also intrigued by the fact that three of these cases are historical. One took place in 1995, one took place in 1987, and one goes all the way back to 1967. This woman, Cxxxx Pxxx, waited forty-five years to report a UFO sighting?